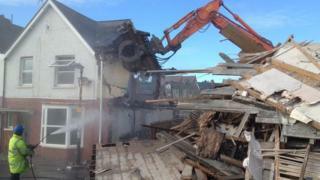 A grandmother's home has been demolished to make way for two retail giants building stores in Aberystwyth. Enid Jones's house was taken down after being compulsory purchased to build a Tesco supermarket and Marks and Spencer store on Glyndwr Road in the town. A planning inspector backed the move, which affected 12 homes, but Mrs Jones refused to sell. Bulldozers moved in and tore down houses on Thursday.